Hospice is a special program that helps provide dignity, comfort and support to patients and their families and friends when a life-limiting illness no longer responds to cure-oriented treatment. Hospice staff members are trained to provide a sensitive support system that helps patients and their families to cope with physical, spiritual and emotional factors related to the patient's terminal condition. Hospice is not a physical place, but a concept of compassionate care that can be provided anywhere the patient resides. Care can be provided in the patient's home, board and care facility, or in a contracted skilled nursing facility. 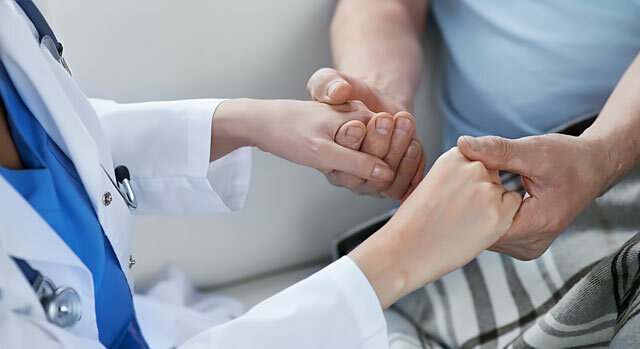 Corona Regional Medical Center joins the National Hospice and Palliative Care Organization and Corona Regional Hospice in envisioning "a world where individuals and families facing serious illness, death and grief will experience the best that humankind can offer." Corona Regional Medical Center is Joint Commission-certified in Home Health and Hospice. Our support does not end with the patient's death. We know that the stress of dealing with a terminal illness, followed by the loss of the loved one, can be devastating. In order to help the family deal with the emotional impact of the death, we provide bereavement care for as long as a year. We also provide community-based grief recovery and bereavement support groups, where families can meet, share emotions and experiences and gain strength from other families who have experienced similar losses. Patients must have a terminal prognosis with a life expectancy of six months or less (certified by the patient's primary care physician and the hospice medical director). Hospice care is intended for patients who are no longer seeking curative treatment and desire pain management, support and comfort. For additional information about Hospice Care at Corona Regional Medical Center, please call 951-735-0274.